Raw, intense, passionate. Lights is one artist music lovers should have mad respect for. The 25-year-old Canadian electronic musician released her sophomore album “Siberia” last fall, and it is definitely a must-have. The album is edgy and hard-hitting with a dominant dub step influence. Fantasy art books that Lights kept with her in the studio while writing and recording the album inspired “Siberia.” She wanted this compilation of music to be reflective of her current interest in deep, dark, otherworldly artistic creations. Lights has a huge following and her fans are very responsive to her music! “Siberia” has been certified gold in Canada, but it couldn’t have gotten there without all of Lights’ supporters. With over 395,000 Twitter followers, Lights can’t stress enough how important it is to connect to her fans. She loves reading Tweets from her followers, but feels especially excited when a fan asks her to pick up a guitar for a jam session. It is clear that Lights poured her heart into the creation of this album and wanted to deliver the best possible sound in each of her songs. Mission accomplished! From the first song, “Siberia,” to the last song, “Day One,” this album is musical magic! Want to learn more about how Lights got her start in music, the story behind the songs of “Siberia” and where she will be going next? 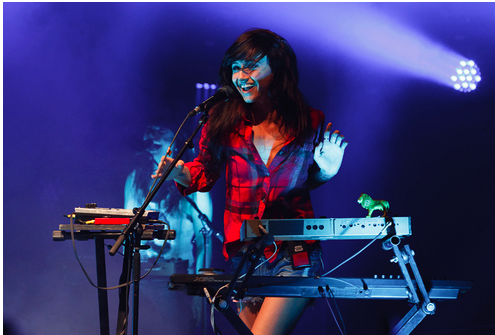 Read on for CG’s exclusive interview with Lights. L: That’s hard…I am so open! When I was young I watched Beauty & The Beast tons of times….it was my favorite! L: I started writing when I was 11 and started making music when I was 13, and when I was 16 I started playing and performing and signing my own songs. I have been at this for basically my whole life, and I think it is one of those things where if you love it you find a way to do it as soon as you can! Who is your favorite singer at the moment? L: One of my favorite singers of all time is Joni Mitchell. She is an amazing singer and songwriter. I also love Bjork; she is the total package. She is an amazing writer and songstress and has the look. You have to have it all to be one of my favorite singers! How did you adopt the name “Lights”? L: It comes from my last name Poxleitner. When I first started putting my music out there and uploading my music on Myspace I signed off as the name “Lights.” It became an artist name and not too long after I took steps to make “Lights” my legal name. It felt [like] too much living under two names (Valerie Anne being my birth name). With something like music that is drawn so much from your personal life, you don’t want to feel like you are living two different lives. I am happy to have “Lights” in the collection of my legal names! When did you first realize you wanted a career in music? L: From the minute I wrote my first song at age 11, I knew I wanted to be a part of the music industry. Once I had made up mind that I wanted to be a singer, there was no change, of course! What genre would you put your music in? What’s the best part of being in the music industry? L: Being able to do something so free. There are very few rules when it comes to something creative like writing and singing. I get to be me in this industry and make my own decisions. I am so fortunate to be in an industry that I love so much. Essentially, you work for yourself and you get to do what you love, and that is amazing. What is the best advice you have been given for your career? L: If you have a plan B, you are not working hard enough on plan A. When I was younger I had this plan B to become a lawyer, but what I always wanted was to be a singer. You have to really sink everything you have into it to make it work. How did you come up with the name “Siberia” for your album? L: I worked with Holy F*** (a Canadian electronica band), and they brought this great rawness and grit to it that made it really special. One of the first songs we did together was “Siberia,” and it made everything really special. That was one of the major reasons why I felt “Siberia” was a really fitting title for the album. The album has a strong dub step influence. What drew you toward that particular musical element? L: I think I remember just hearing elements in it that I was really moved by. It is such a new sound and people are really latching onto it. It is the use of electronic elements in a way that has not been used before. There are these multi-layered, distorted basses that drop instead of uplift the chorus, which is kind of antisepsis to the way a pop chorus should go. I found it really cool hearing dub step used that way for the first time and really wanted to apply that to my music strictly because my music is kind of the opposite to that. Previously, my music has been very light and airy, so integrating this hardness and heaviness was a really cool combination. Was it hard to move from light, airy music to hard, heavy music? L: It was natural. If you like it there is no reason you should not figure out a way to embrace it. Music is free, so nothing should hold you back from what you want to try. L: Everything I love! There were so many songs that were written for the album and these are the best of them. I really like “Flux and Flow;” it has got this cool dynamic and this wide vocal range. It is a great one to play live. What was it like putting this album together? L: It was really fun….it was approached a little differently because there were different songwriting styles in a lot of the songs. “Cactus in the Valley” was something that was wrote in acoustic on my own and then later transformed it to something for the album. Then there is something like “Siberia” where I was sitting down with Holy F*** and jamming and then taking parts of that jam session, packing it together and writing a song over that. That songwriting style has this rawness that I had never heard before in my music, and it also had this amazing soul to it. It is kind of like an oxymoron that people could perceive it exactly the same way it felt. The whole experience was just really cool. What were some of your main inspirations for the album? L: It sounds kind of funny, but I brought in this fantasy art book along with me everyday while I was writing and recording. This particular artist does art that is dark and verging on sexual fantasies. There is a lot of magic and dragons in his work, and he also does covers for heavy metal magazines. There is something really otherworldly about his art, and it was such a cool setting to write a soundtrack against. I remember looking at the pictures and thinking that the dark, alienist accents juxtaposed against the very beautiful and strong images as something that I wanted to write music on top of. Do you think about what you want the music video to be like when you write music? L: No. For me I like to take it one step at a time. When I first started writing at age 11, I would come up with all these ideas for album artwork and get caught up in processes that should come after your song is ready. I love working on the styling and the story of the videos after I have written the song! What is it like putting together music videos? L: It is so much fun, it does not feel like work! You make your dreams come true in your videos. You can include fantasy and fiction and make anything happen; it is exciting to see how everything unfolds after a song is written. Which of your music videos if your favorite? L: It is hard to say because every music video was made at a different time and it representative of where I was at during that point of my career. I am very attached to my more recent videos because those represent where I am now and what my current interests are. Looking back, I love all of them, but right now my newest one is “Banner,” and I love that one. There is this incredible post-apocalyptic setting, which we shot on location in some weird desert near L.A. It was really cool and fun! L: Yeah! You always get a little bit of butterflies before a performance, but I feel like that is definitely good. What is it like backstage pre-performance? L: I don’t have any rituals or warm-ups that I like to stick to. We usually just hang out and fool around with a ukulele or harmonica, and I work on getting my vocal cords ready. What is one thing you always have with you on stage? L: Guitar picks in my back right pocket. I always want at least two because I always need them. What do you like to wear for performances? L: I don’t usually wear something different off-stage that I do onstage. I think it is important to be yourself and be comfortable on stage. I want my stage performance and my energy to be representative of who I am. I don’t want to feel like I am someone different when I am performing. What is the vibe of your performances? L: I want everyone to just sing along and lose themselves in my music and not just stand there and worship me and my band. What is it like to have so many fans? L: It is awesome...it is great! The pick-me-up when I feel down….all I have to do is take a look at my Twitter to find overwhelming support from my fan base. It makes me want to challenge myself more to keep them entertained and happy. What is the most rewarding thing a fan has said to you? L: I always think it is really cool when a girl just comes up and says “do you want to pick up a guitar?” I always like seeing more females and more girls starting in an industry that is largely males. It is a great way to make new friends and experience new music when I jam with fans. What is one of the craziest things a fan has done for you? L: At one point someone bought me a small plot of land. That was just kind of crazy. Is there a particular singer or band that you want to collaborate with in the future? L: No. I feel like the best collaborations that I have ever done, like the Holy F*** collaboration for example, happen naturally and unexpectedly. Sometimes you work with someone that you have wanted to work with for so long, and when it happens you end up being like “oh, that wasn’t as cool as I thought it would be.” If it is free and natural and meant to be, it will happen. Where do you want your career to be in the next 5-10 years? L: I want more albums, and I want every performance to be better then the last. I want my fan base to build slowly and positively. I also want to do little things along the way to enrich my experiences. I have been taking computer sciences, so I can learn more about that world, which is ever growing, and think it will help me get my music out there. I also want to keep working on art and incorporating that into my music. I want to maybe do an art show at some point. I want to keep all my creative outlets exercised. What should fans be looking out for from you in the future? L: Lots of touring! If you check out my website, you will see we are constantly updating our information. I have been touring all over Australia, the United Kingdom, United States and Canada with more touring to come. Also, stay tuned for small collaborations. Keep up with Lights by following her on Twitter! i love lights... they have really cool songs! i went and bought the album....she seems so nice in her interview!! !